Join our monthly machine embroidery workshop and learn a different technique each month to create a new project. This workshop is ideal for those who fancy a relaxing and peaceful day of creativity. It is a brilliant workshop which allows participants to be introduced to the wonderful world of Glass Fusing. The techniques used are easy to pick up and you will create a range of beautiful glass items that can be treasured or given away as special gifts. We offer a variety of patchwork and creative textile classes, for the complete beginners or the more advanced student. Our experienced friendly tutors will stretch your creative skills the result will be a stunning totally unique wall hanging or quilt that you and your family will treasure a lifetime. So come along and join us for a fun day and learn something new today. Create an original hand woven scarf at this beginners weaving workshop. A perfect opportunity to design and make a totally unique gift or a fabulous treat for yourself. Yes this really can be completed in a day, no UFO's in this class. These small Bread Baskets can have multiple uses and look great on any kitchen table. Ideal for beginners and those new to basketry, over the day you'll learn basic basketry techniques to create a sturdy, useful basket. Spend the morning making your very own bespoke lampshade. This workshop includes the kit & fabric to make a 30cm size lampshade suitable for a pendant (ceiling) or table lamp , choose your own fabric from the vast display in the shop or why not use one of your own. 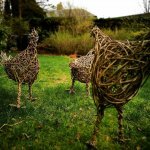 Join Jovanka on this one day workshop to create this beautiful bird sculpture, ideal for your garden. Love Colour? Fancy a go at weaving? This is the weave workshop for you. Immerse yourself in a world of colour, yarn and texture and discover the tranquil art of weaving in this 3 hour beginners workshop. If any of the workshops are sold out and you would like to register your interest for future classes please contact us on tel 01422 842549 or email info@thequiltcabin.co.uk. If you have a group of 6 - 8 people we would be happy to arrange a special workshop for you. Bespoke to your requirements we will tailor make a workshop based on your group. With friendly experienced tutors, a fun day is sure to be had, whilst learning a new skill.